Moms Give Yourself that Dream Mother’s Day Gift: A Clean Kid’s Bedroom! There’s one thing that ALL moms want for Mother’s Day and that’s for their kids to clean their rooms without having to be told to “Do It!” Unfortunately, the one gift all moms want is the one gift that most moms NEVER get. Well, we have a solution. It takes you…Mom…getting your kids the gift of storage before Mother’s Day and asking them to fill up the storage items, so on Mother’s Day you can get your gift of a clean and clutter-free kids bedroom. When doing this don’t give your kids a stack of boring, plastic storage bins that they’ll hate. Give your kids some ultra stylish kids bedroom storage pieces that will make their room pop with style. This will encourage your kids to use the storage pieces in the room during every clean-up time. I’ve put together an inspiration board of some of our modern and stylish kids bedroom storage solutions that will not only create a very hip looking space, but a very neat kid’s room as well. I hope this gives you inspiration to do what you have to do to get that perfect Mother’s Day gift you’ve always wanted! And Happy Mother’s Day on behalf of all the staff at SimplyKidsFurniture! Here’s the List of kids bedroom storage furniture that is on our inspiration board. I’ve seen sling bookcases in lots of friend’s houses and wondered what was so special about this type of kid’s furniture. After some question asking and review reading, I now want to get one! Here’s why. The sling bookshelf takes up a lot less space than a regular bookcase since it’s shorter and thinner from front to back than most bookcases. It also has a neutral color, so it looks great with many room decors and furniture sets. This is the type of bookshelf that should be in the center of your child’s reading area. It allows you to display books facing forward, so that the titles and illustrations can be seen. When kids can see the colorful pictures and names of books it will make the literature so much more appealing! If you have tons of books, keep your entire collection on another, larger bookcase, then have your children pick out the “books of the week” and place all their favorites in the sling bookshelf, so they’re ready and waiting for family reading time. So, close your eyes and imagine how great this sling bookshelf would look in your child’s reading area. Now that you’ve imagined it make it a reality by getting your Sling Bookshelf by KidKraft today! Kids of all ages love books. Unfortunately, if your kid has a teeny, weeny bedroom or playroom book storage can be a challenge. 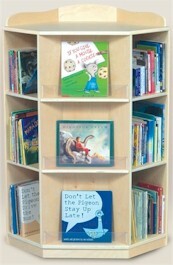 If your child’s room is just too small for a standard size bookcase there is a solution…a corner bookcase. Corners are underused spaces in small rooms and usually remain empty. Fortunately, you can add a corner bookcase that fits snug as a bug to keep books in order, but out of the way. We carry two stylish corner bookcases with neutral finishes that will look great in any corner of a room. Check them out below to decide which one is best for your kid’s bedroom or playroom. This is a three shelf bookcase that can fit well in any corner of a room. The top shelf is quite big and perfect for displaying those larger books. The other shelves can hold chapter books or novels with ease. 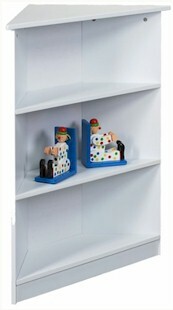 This shelf is also great for displaying photos or holding special toys. If your child struggles with space for her favorite books, this bookshelf will do the trick! This corner bookcase is one stylish and functional addition for any kid’s playroom or bedroom. 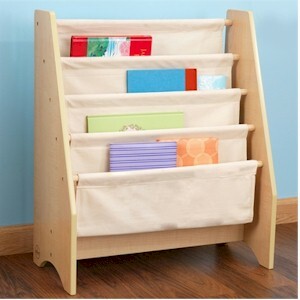 It has several sections with adjustable shelves, so your child can arrange books anyway she likes. This solid birch bookcase will also match with lots of room decors and is finished with a UV coating to protect it against wear and tear. Can’t you just picture this unique bookcase in your home? !